Shelving Direct pallet racking is designed with tear-drop style upright punching. Uprights allow shelf levels to be adjusted at two inch increments. Teardrop perforations are located on the front, whose purpose is to fit beams together. Shelving Direct offers different variations of upright frames. Choose your desired frame height and depth to design your own starter pallet racking unit. 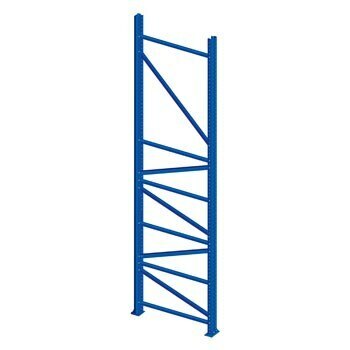 Each bolted pallet rack upright frame comes preassembled with posts, diagonal struts, and foot plates. 96", 120", 144", 168", 192", 240"